Looking to elevate the curb appeal of your home with beautiful windows and patio doors, while also keeping true to a distinct architectural style? 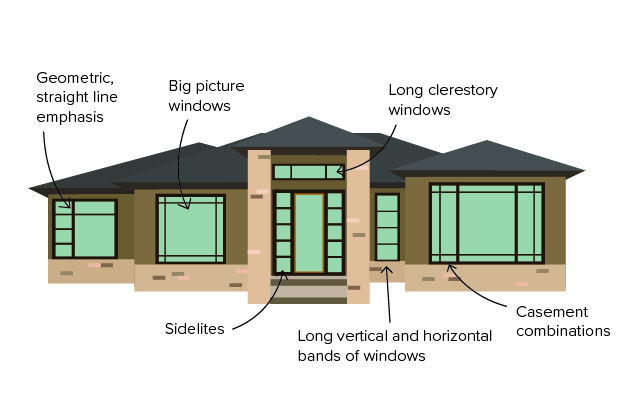 Explore the top nine architectural styles we love and the windows and doors that complement them. Originated in 17th century New England, Cape Cod homes are generally one-and-a-half stories with a steep pitched roof and a small porch over the front door. Fireplaces served as a central element in the home, leaving chimneys stemming up through the middle of the roof. 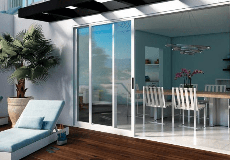 French swinging or French-style sliding doors are recommended for patios. Double-opening doors allow for greater ventilation while keeping with the traditional style of a Cape Cod home. To learn more about Cape Cod style and the window details we recommend for grids, frame material, and colors, click here. The Tudor style has been around for several hundred years, developing out of fifteenth century English during the Tudor period. Defining features include stucco exterior complimented by brick and stone sections, arched doorways and combinations of tall, narrow windows with dark trim. Many of these homes contain exposed wood features that the windows may match or complement. Long, narrow-shaped casement windows are a versatile choice for Tudor homes. They balance the architectural design while emphasizing the height of the home. Casement and picture window combinations are usually in groups of two or three and fit within the exposed timbers. French swinging doors integrate well with long, narrow-shaped windows. The wider stiles and rails are a wonderful complement to the manor style architecture. Add sidelights to swinging French doors to bring more natural light into a Tudor home. 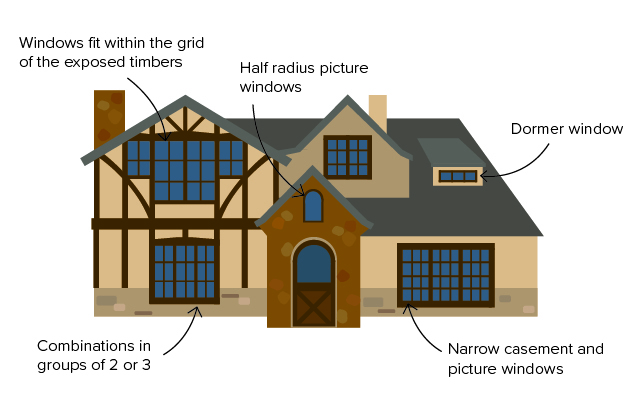 To learn more about Tudor style and the window details we recommend for grids, frame material, and colors, click here. Colonial homes have wide and varied styles due to influences from Dutch, French, Spanish, New England and Georgian architecture. Usually sitting two and a half stories tall, colonial homes are commonly made of red brick with multiple chimneys. French sliding patio doors are recommended for colonial homes. The classic look matches the architectural style while the sliding functionality adds space saving convenience. 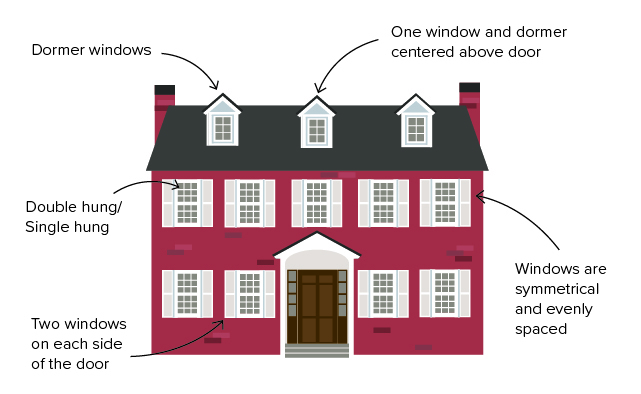 To learn more about Colonial style and the window details we recommend for grids, frame material, and colors, click here. During the twentieth century Industrial Revolution in Great Britain, millions of houses were built in a housing boom now referred to as “Victorian” houses. In the United States, Victorian-era houses often include ornate décor with elaborate details, a multitude of trim and a bold color palette. Wrap around porches with decorative railings and columns distinguish this style. Bay and bow windows are almost always implemented. They complement the ornate style of Victorian and Queen Anne homes by dividing the view into different planes and bringing in more light. These homes often use narrow double hung windows in combination with arch windows on top to create the appearance of height. French-Style sliding patio doors accentuate the traditional architecture of Victorian/Queen Anne homes. 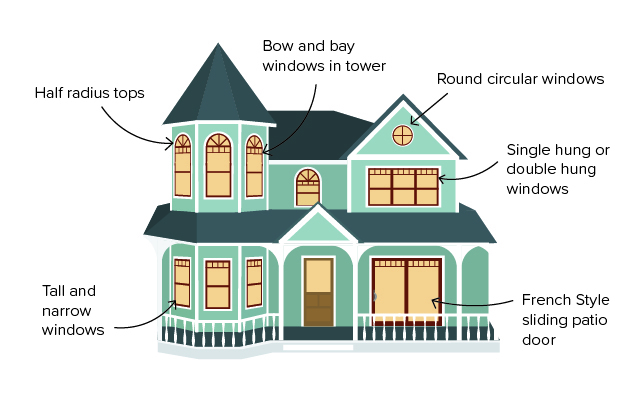 To learn more about Victorian/Queen Anne style and the window details we recommend for grids, frame material, and colors, click here. Take this American home classic to the next level with windows and doors that complement its signature style. American Craftsman style and bungalows are variations of an affordable housing type that swept across America in the early twentieth century. Distinguished with a front porch, squared tapered columns, and an open floor plan, craftsman and bungalow homes are ideally suited for mild climates. Double Hung windows in combination with casement and awning windows help create the patterns typically associated with Craftsman Bungalow style houses. Window combinations are often seen in groups of two or three. French patio doors can be a great addition on the front porch or to the back yard. In addition to adding convenience, they help bring more daylight into the home. 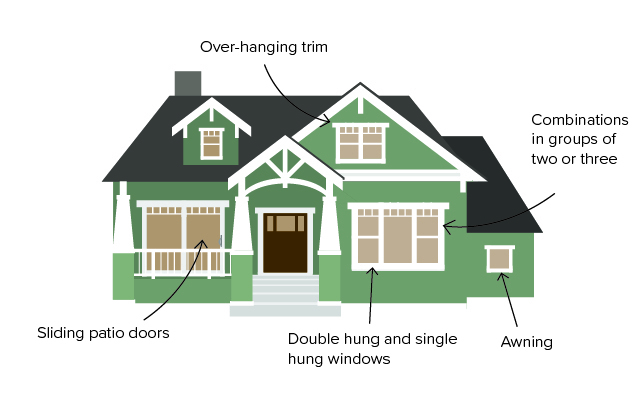 To learn more about Craftsman/Bungalow style and the window details we recommend for grids, frame material, and colors, click here. As the name suggests, Spanish, Mediterranean, and Stucco homes are influenced by the region in its descriptive. This ranges from older homes with small windows and large doors topped by arch windows, to new-style homes that have larger windows. This style of architecture is often noted by the exterior stucco material, archways and curves, and ceramic terracotta roofs to deflect the hot sun. Casement windows are a popular operating style in these homes. They can be tall and narrow while standing alone, or come in pairs of two. Tall windows, sometimes arched, are often seen in a walk out bow. 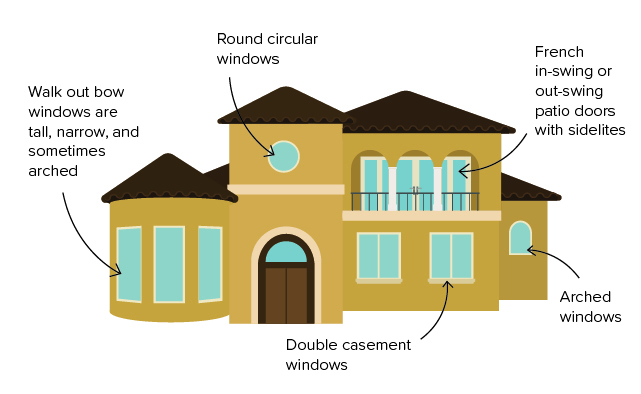 Arch windows are common in stucco style homes as they complement the curved lines of the architecture. To learn more about Stucco, Spanish, and Mediterranean style and the window details we recommend for grids, frame material, and colors, click here. Originally built to echo the flat prairie landscape, these homes value strong horizontal lines and wide open spaces. Frank Lloyd Wright revolutionized the American home when he began to design Prairie style houses. Mostly an upper class or upper middle class movement, prairie style homes usually have low-pitched roofs and straight-line, geometric patterning. Prairie Style houses employ the use of a high band of narrow windows above doors or bordering the top of a room. This is called a clerestory which is made from picture windows because they are out of reach. Another common operating style in Prairie homes are awning windows placed together in rows. This style allows for ventilation while maintaining the accented look of a Prairie Style home. Sliding patio doors are often paired with sidelites which match the low horizontal lines and maintain the open interior spaces of a Prairie Style home. This versatile patio door style can accommodate a variety of decorating and placement. To learn more about Prairie style and the window details we recommend for grids, frame material, and colors, click here. Ranch or Split-Level homes became popular as suburbia expanded to accommodate the growth of families in post-World War II America. Split-level is a variation of the raised Ranch style with a basement, main floor, and upstairs. Many of these homes feature wood and brick siding with a porch over the front door. Large picture windows fit the Ranch/Split-Level style very well. An abundance of glass lets in light and provides a contemporary style. 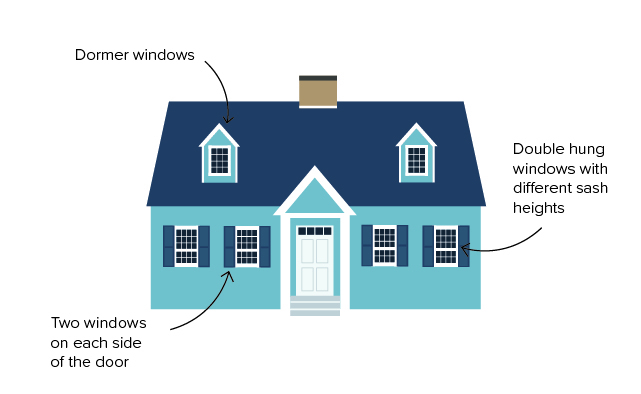 Double hung windows are common in combination sets with picture windows above or below. Bay and bow windows can also be a wonderful addition to a Ranch style home. 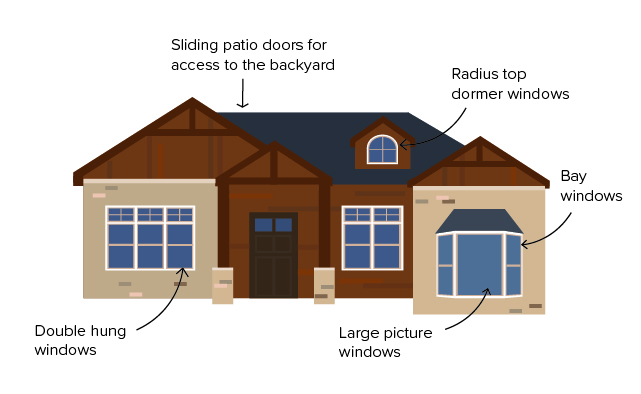 Ranch/Split Level homes were often built with large patios and beautiful backyards. Sliding patio doors are a great solution for transitioning to the outdoor space area while still maintaining a sleek entry. To learn more about Ranch/Split Level style and the window details we recommend for grids, frame material, and colors, click here. Clean lines, smooth surfaces and lots of light encompass the look of a one-of-a-kind modern home. Ornamentation is kept at a minimum to focus on a large perceived space and welcome indoor-outdoor living. While modern homes are varied in how they are designed, sliding horizontal windows can almost always be a great choice. Another popular operating style is awning, often times placed below large picture windows as it brings in subtle fresh air. Moving Glass Wall Systems are a popular choice in contemporary homes as they bring in ample amounts of natural light and highlight wonderful views. The narrow frames help to ensure these doors are cohesive with the design and with the indoor-outdoor living trend. 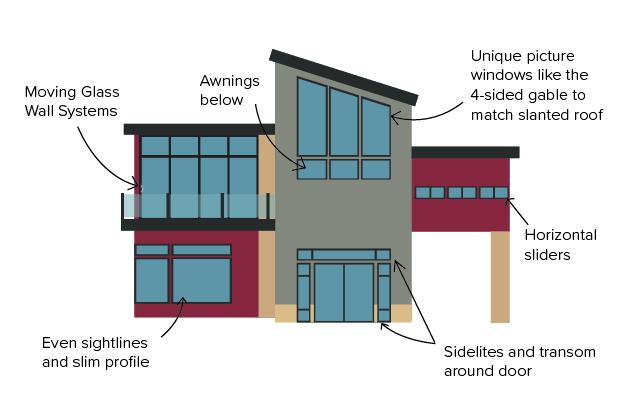 To learn more about Modern style and the window details we recommend for grids, frame material, and colors, click here.